Caroline has been a handful tonight. Lynn had to leave to go to a Farm Bureau meeting. Claire was leisurely finishing her dinner and Caroline was running, turning flips on the floor, and trying to take the drawer pulls off the the antique buffet. Finally Claire was finished and I tried to take a quick bath while supervising the girls who were sprinting up and down the hall yelling at the top of their lungs. The kid has been using a sight word app on my tablet to work on her sight words. She’s recently decided she wants to read. 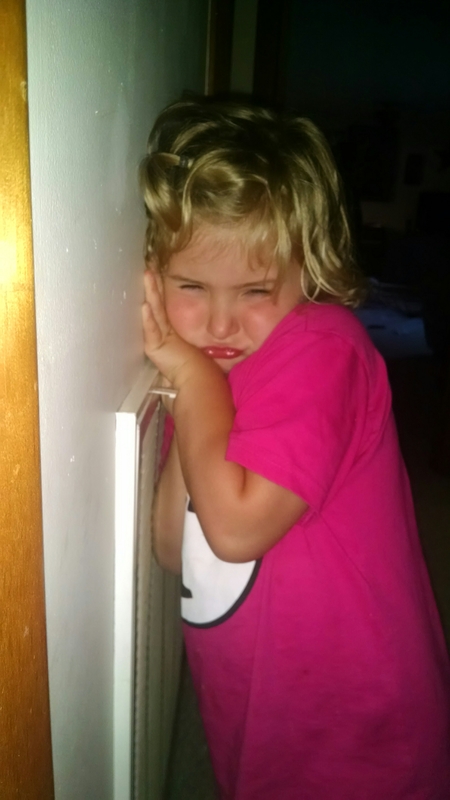 Kicking, screaming, wailing, sniveling, I asked her to go to her room until she could quit the fit. Finally, she came back to find me. Mad because I did not let her play her sight word game. To my credit, I was able to hold it together and not laugh. This ratbaby is a strong willed dramatic thing! Poor Lynn got back home in the middle of the drama and settled down his oldest daughter. Gee. Teenage years should be fun. Why are you being mean to her children, Jessica? How dare you, lol. How does she come up with this stuff? Not sure I could have not laughed out loud? I don’t know what she’s going to say next. She’s a thinker, this one! I’m not sure my poor brain can keep up.